Shapestones performs Professional Bug Detection on a wide range of people who need to protect Privacy and Information. Our Professional Bug Sweeping is a technical and physical investigation conducted by highly trained technicians in the UK, U.S. and Italy, utilizing top counter-espionage equipment and most-effective investigative techniques. There are so many ways to spy on people, like man in the middle attack, wiretapping, hidden cameras or just audio bug, tracking and tracing and more utilizing various protocols and frequencies (Wifi 2.4-5 Ghz, Visible Light, GSM, LTE, UMTS, VLF, and much more) and in case of civil and criminal trial some sophisticated techniques can be deployed by private investigator or org. A rich assortment of spy devices are available on the market and on the deep web, also “all-in-one” bud sweep detector devices, but very rarely you can find a spy device with one of those devices. Do you believe that your vehicle, home, phone, residence or other location may be bugged or that you are being listened to or be under surveillance? Our expert and highly-trained technicians can discover and identify complex surveillance devices that can compromise your privacy or information. You benefit from the most advanced, professional grade, counter-surveillance equipment, and expertise that restore back the peace of mind. We will decide with you the best solution depending on your case and needs. In example, a Domestic case where the attacker is a family friend, could require a different technical approach from a Civil trial, where the ex partner can hire a Private Investigator to deploy high quality bugging devices. Our technical team will suggest the most effective solution to solve your problem and discover the true. Are you worry about your and your family privacy in your Home? Are you suspecting that your ex-partner, mates, neighbor or a stranger are spying you? Quick and easy bug sweep service to protect your privacy at your home or vehicle. • Locate hidden spy devices in any status: active / standby / switch off. Are you in a civil trial? In a dispute between private parties like divorce or child dispute, and suspect that your opponent put you under surveillance? Maybe with the help of a private investigator? Advanced bug sweeps able to locate sophisticated surveillance attacks. • The number of technicians (between 1 and 3) and the time necessary to perform the sweep, it depends on number or room and vehicles to be investigated. Just for example: typically, a Civil bug detection of a 3 bedrooms house needs to be completed by 2 technicians for a time between 4 and 6 hours. Domestic bug sweep can be conducted sometime by just 1 technician, and in a small flat can require less than 4 hours. Travel cost If your home is 10 miles from our office an additional costs would be mileage from the office address to your home address and return, charged at 40p per mile (free first 10 miles). Any site outside of London (M25 ring) would incur an hourly charge of £20ph for travel time. The rate covers the using of unique bug detection equipment, in most cases are the same used by many government agencies and very expensive (average set value is usually £80,000+). Please understand that there is no a single device that can detect hidden cameras, audio bugs, telephone taps, or GPS tracker hidden in a vehicle. 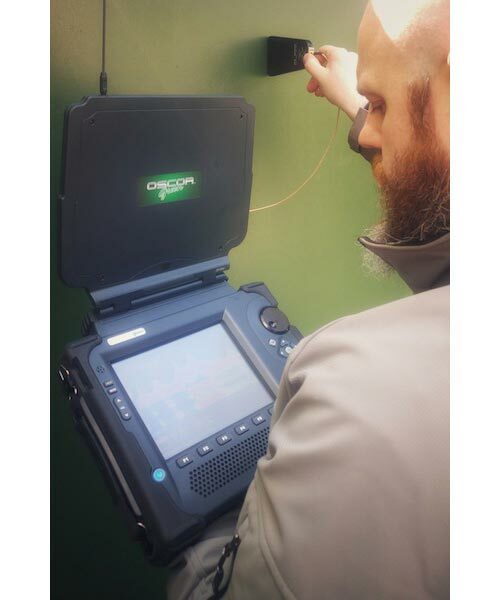 The OSCOR Green Spectrum Analyzer is designed to detect illicit eavesdropping signals, perform site surveys for communication systems, conduct radio frequency (RF) emissions analysis, and investigate misuse of the RF spectrum. 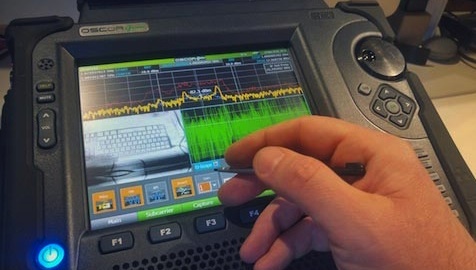 The OSCOR Green is a portable spectrum analyzer that sweeps 8/24 GHz in one second to quickly detect transmitting electronic surveillance devices and ensure that spectrum activity is captured. Non-Linear Junction Detector (NLJD) finds potential eavesdropping devices in walls, fixtures, furniture, floors, ceilings, vehicle, or other surfaces. NLJDs are devices designed to detect and locate hidden cameras, microphones, and other electronic devices, in any operational mode: active, standby, turned off, radiating, or hard wired. NLJD technology has proven to be most effective in the detection of semiconductors containing multiple layers of silicon, a P-Type and an N-Type, and an essential piece of equipment for efficient “Bug Sweep”. High gain audio amplifier used to detect and identify surveillance devices attached to building wiring such as telephone wiring, LAN and server systems, AC Power, Alarm wire etc. Key piece of equipment to detect heat created by the electricity moving through the surveillance parasitic devices. TSCM survey (Bug Sweeping) is a specialized examination of an area or vehicle to detect, locate and identify any eavesdropping devices, up to TSCM Threat Level 9. We specialize in identifying suspicious RF signals from VLF to 24 GHz, analog/digital and data transmitters, including Wi-Fi (2.4 & 5 GHz), GSM-UMTS-LTE. After meeting you and evaluating the threat we conduct a quick inspection which allows us to establish the adequate Technical Investigation for your case. After we have conducted the survey we report back to you on our findings, flagging up particular risks and making recommendations on how to ensure your privacy isn’t compromised. Our team of professional technicians has vast experience in electronics and telecommunications, with years of military and law enforcement experience.